We ADORE wallpaper and have no shame in professing our love!! However, the trick is to use wallpaper in very strategic and minimal ways if you’re just getting into it. It’s easy to overwhelm a space by using too much wallpaper (all walls and ceilings sometimes) and picking a paper that is the wrong scale for the room resulting in the space looking too busy. It's always a safe bet to do an accent wall if you're unsure of the potential problems outlined above. When there are so many great wallpaper companies out there it's a fun (and hard) process to select just one! So with that being said let’s look at some of the times we’ve used wallpaper in a space to create an accent wall. 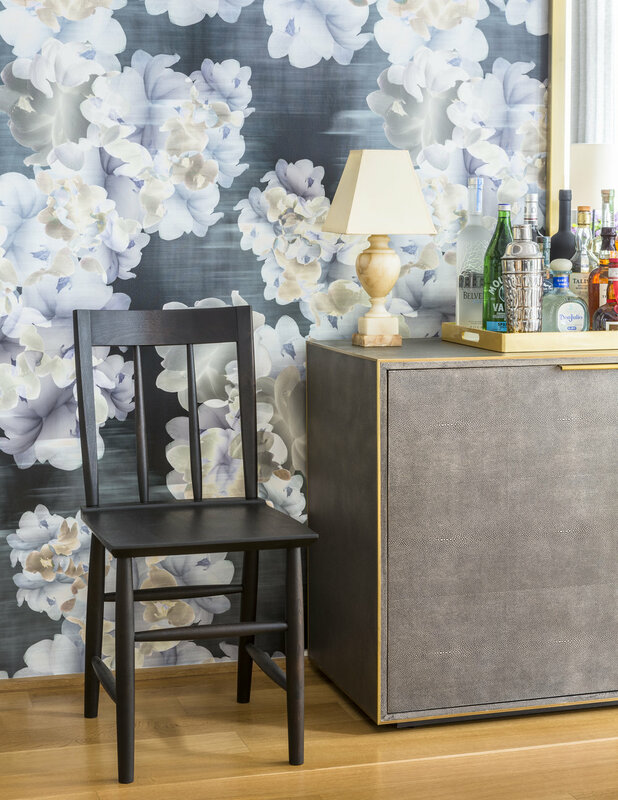 We also share some of absolute favorite wallpaper companies to be on the lookout for! Trove’s Alycone. A modern way of making wallpaper. All digitally printed. Trove is a really cool wallpaper company. If you’re not familiar with them, you have to check out their website! They have a very modern take on designing prints, and their printing process is also modern- all digital. This print is an oversized hydrangea flower. The wall this is hung on is a dining wall that is about 15’ wide. The large scale works for the long expanse and high ceilings. The pattern is highly concentrated so we elected to use it on one wall only. P.S they do a guest collection for Knoll textiles that is also fun and colorful. 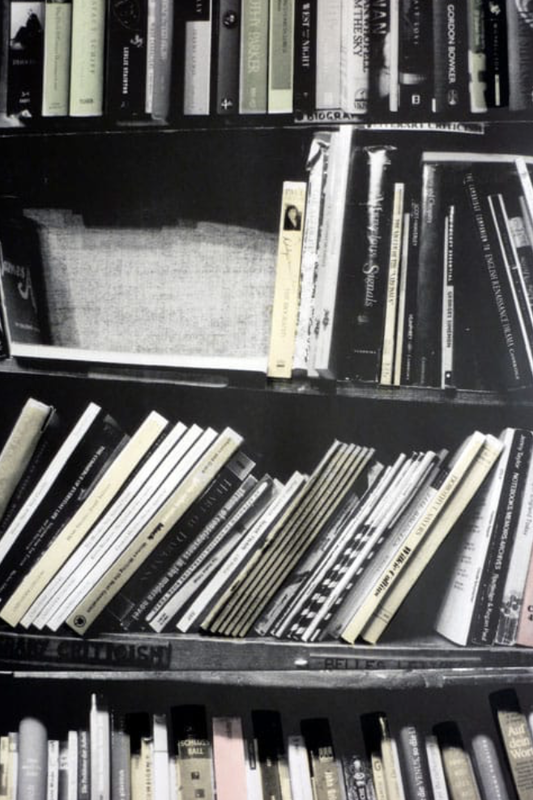 Deborah Bowness’ “genuine fake bookshelf” creates an illusion of a bookcase. Another great wallpaper company you need to familiarize yourself with- Deborah Bowness! Their papers play with your sense of reality and what you’re actually seeing. They take everyday elements like bookshelves, window treatments, etc and distort them slightly resulting in backdrops that are fun and a bit disorienting (in a good way!). This paper could actually be used on all walls and not overwhelm the room because of the spacing in between each stack, but sometimes we think you can have too much a good thing. In this space we prefer it on one wall since there are also built-in shelves. It’s just enough whimsy for this future bookworm. A great use of the wallpaper accent wall is in an entry with a staircase! The movement of the pattern in the wallpaper by Jill Malek enforces that the space is transitional. The movement in the paper brings your eye up the stairs. With this paper we wrapped it to the front door to connect the front door to the stairs as a visual pathway. Porter Teleo’s Kintsugi. Everyone at the company are artists that hand paint the wallpaper panels. So many of these companies have great stories and craftsmanship behind their work with Porter Teleo being one at the top of that list. 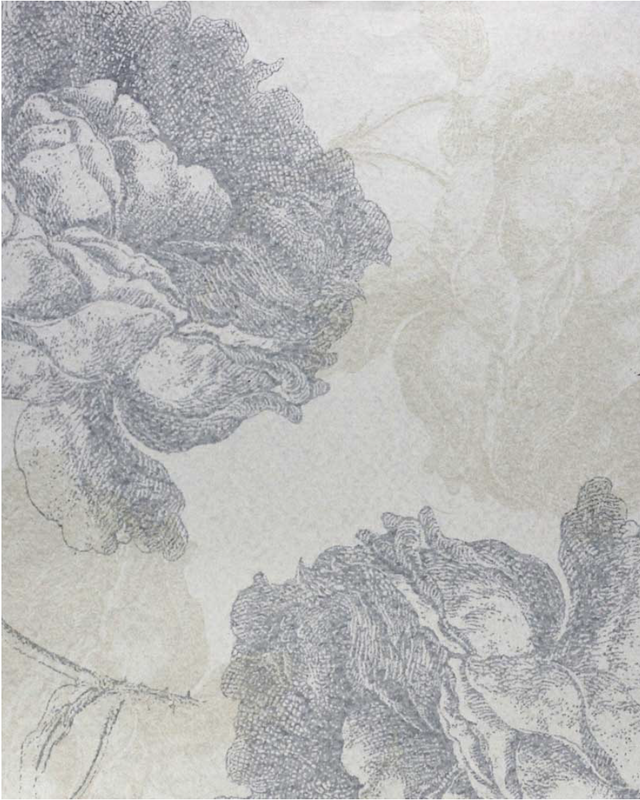 Each panel of wallpaper is hand painted by a group of artists in Kansas. Again, we used the one long dining wall as a place to do an accent wall. It helps define the dining space in an otherwise open loft. It helps signify that this space is another area of the room apart from the living room. Insider tip for designing open, loft like spaces: a great result of doing an accent wall is that it helps define and separate spaces subtly without having to add permanent architectural elements or furniture. TylerGraphic’s Rose du Roi hand printed on watercolor paper. This subtle and relaxing TylerGraphic wallpaper always brings us a sense of serenity…. It could easily go anywhere in a project, but we like it best in a bedroom! This client was a little pattern shy so we couldn’t convince her to cover all 4 walls in this. The next best option? An accent wall on the bed wall! If you’re going put wallpaper on one wall in a bedroom I definitely recommend doing it on the bed wall and not the dresser wall as I’ve seen it done before. Installing it on the bed wall draws your attention to the main event in the room – the bed. And I’m nearly positive this wallpaper will give you sweet dreams! What are your thoughts on picking the perfect wallpaper for a space? Share your comments below.